The past envisions the future in a short book that spans a century of revolutions in communications. This would have been a deeper book if it were a conventional biography of David Sarnoff (1891-1971), “the man who had sailed into New York Harbor as a nine year old boy and gone on to foresee every major communications advance from the wireless telegraph to satellites—and fought to bring them all to the general public.” It often seems like an account of a relationship and a rift between the empire-building RCA tycoon and Edwin Armstrong (1890-1954), “the most prolific inventor since Thomas Edison,” whose advances were crucial to Sarnoff’s vision yet whose path diverged when he saw Sarnoff focusing on TV and perhaps impeding the progress of the FM radio advances that Armstrong championed. Woolley begins with the suicide of Armstrong, who felt betrayed by Sarnoff, and circles back to his death about two-thirds of the way through, leaving the stage to Sarnoff alone. Drawing from court transcripts, the account of the rift between the former friends has the dramatic tension and narrative propulsion of a historical novel, yet an oddly structured one once Armstrong is gone. What the author dubs “Act III” is the most revelatory, as it shows Sarnoff extending his vision from radio to TV to the computer age. 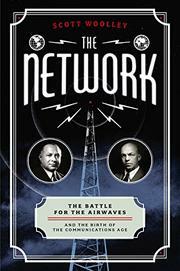 In his discussion of sources, Woolley concludes, “David Sarnoff’s remarkable speech predicting the rise of fiber optics and the Internet was made in 1965, but has been ignored until now.” As the telegraph gave way to radio, then to TV and the Internet, the book shows how Sarnoff continued to embody the lessons he learned from Marconi in the telegraph age: “When wagering on the future of a new wireless technology, always bet on the optimists—eventually they’re going to be right.” Armstrong was one of those optimists, until he became a casualty. Beginning in the era of an “ever-expanding worldwide web of cables,” the book is readable but could have been fleshed out more fully.